The Staff Selection Commission (SSC) in keeping with the SSC Calendar is all set to release a detailed Notification in respect of Group ‘C’ Posts of Multi-Tasking (Non–Technical) Staff Examination-2019 for recruitment to different Posts in different States / Union Territories. Applications for SSC MTS 2019 will be released soon through the website. SSC is going to commence the Multi Tasking Staff recruitment from 22/04/2019 to 22/05/2019. 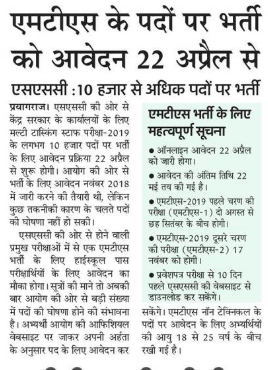 As per SSC’s Annual Examination Calendar, MTS Applications started from 22nd April 2019 and ended on 22nd May 2019. But due to the selection of the agency for the online examination, the application process has not yet started. SSC MTS 2019 Form:- Based on the announcement, Staff Selection Commission (SSC) shall be invited online applications form for more than 10000 Vacancies from 22/04/2019 through the website of the official. The Staff Selection Commission (SSC) shall issue the e-Admit Cards / Hall Tickets TWO WEEKS PRIOR to the Date of the commencement of the Optical Mark Recognition Based Written Examination. SSC is going to commence the application process for MTS Jobs from 22 April 2019. All the applicants can apply for the online applications till 22 May 2019 through the official website of commission. The Candidate must have completed Minimum 18 Years but must not exceed 25 Years of Age as on the Cut-off Date). He / She must have Passed Matriculation Examination OR Equivalent from a recognized Board. Note: The Candidates having not acquired / not able to acquire the Educational Qualification as on the Closing Date of Receipt of the Application shall neither be eligible and need not apply. Rs. 100/- (Rupees One Hundred only) through Central Recruitment Fee Stamps for each Application. The Application Fee is exempted for all Women Candidates and the candidates belonging to the Scheduled Caste, Scheduled Tribe, Physically Handicapped, and Ex-Servicemen eligible for reservation. Paper-I will consist of the Objective-Type Multiple Choice Questions only. The Questions will be set both in English & Hindi Language. The Commission reserves the right to set the questions additionally in Regional Languages subject to Technical Feasibility. The Candidates are, therefore, advised to keep this in mind while answering the Objective-Type Multiple Choice Questions. Paper-II will be of Descriptive nature where the candidate will have to write short Essay / Letter in English or any Language included in the 8th Schedule of the Constitution. Paper-II will only be of Qualifying Nature that is aimed at testing the Elementary Language Skills in view of the categorization of the Post as Group-C and in view of job requirements. The Commission shall hold Paper-II for those candidates who shall be meeting with the Cut-Off prescribed by the Commission in Paper-I for different categories. We would intimate the exact Date followed by the Staff Selection Commission’s announcement. The Staff Selection Commission would shortlist the Candidates for the Paper-II based on their respective performance in Paper-I. Paper-II will only of Qualifying Nature. The Cut-offs in Paper-I and qualifying marks in Paper-II may be different for vacancies in each State / UT will be fixed at the discretion of the Commission. Candidates for each State / UT will be finally selected on the basis of their individual performance in Paper-I, subject to their meeting with the Basic Qualifying Standards fixed in Paper-II. The Candidates will be shortlisted for the Paper-II on the basis of their performance in Paper-I. Paper-II will only of qualifying nature. The Staff Selection Commission, at its discretion, would determine / fix the Cut-offs in Paper-I and Minimum Qualifying Marks in Paper-II might be different for vacancies in each State/UT. The Candidates for each State / UT will be finally selected based on their performance in Paper-I, subject to their meeting basic qualifying standards fixed in Paper-II. The SC, ST, OBC and PH candidates selected on their own Merit without relaxed Standards, will not be adjusted against the reserved share of vacancies. Physically Handicapped (OH/VH) Category candidate who qualifies on the basis of relaxed standards is to be counted against reserved vacancies and not against general vacancies subject to fitness of such Candidate for selection. By referring to the Marks in Part-III of the Objective Type Paper. By referring to Marks in Part-II of the Objective Type Paper. Date of birth i.e. the candidate Older in age gets preference. By referring to the Alphabetical Order of the names taking first name into consideration. For Swift Updates on the SSC intimation on the exact Date for issuance of the e-Admission Letters / Admit Cards / Hall Tickets, Category wise Expected Cut-Off Marks, Fully solved Answers Key in A, B, C & D Series of Forenoon Session (FNS) & Afternoon Session (ANS), Optical Mark Recognition Answer Sheet in A, B, C & D Series, Interview Schedule (if any), Common / Merit List, Final Select List, Final Result, Finally Recommended Candidates, Last Recommended Candidate.